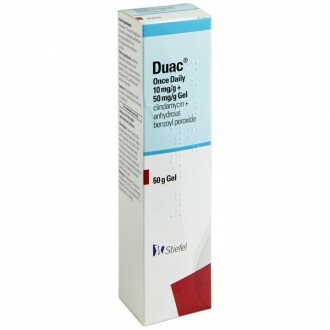 Buy Epiduo gel to treat adult acne from our online pharmacy. This lightweight gel is a prescription-only acne gel that will help control moderate to severe acne flare ups and breakouts — including ones on your back. It has two main active ingredients that help control the skin inflammation and keep your spots from reoccurring: adapalene 0.1% and benzoyl peroxide 2.5%. 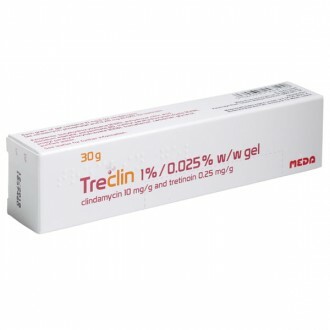 Epiduo 0.1%/2.5% gel is a prescription acne treatment which is available to order from The Independent Pharmacy Online Doctor service. You can buy Epiduo gel online following a free consultation from one of our specialists. To find out more about acne and see all the available treatments, visit our acne page. Epiduo is a topical gel used to treat acne. 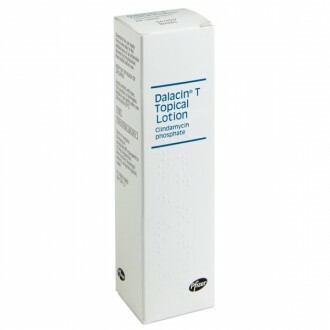 It is manufactured by Galderma UK Ltd and comes in a practical 45g pump dispenser. Epiduo gel contains two active ingredients: adapalene 0.1% and benzoyl peroxide 2.5%. Sebum is produced by glands just under the surface of the skin called sebaceous glands. Sebum is a natural, oily substance needed to keep the skin smooth and supple. However, sufferers of acne often produce too much sebum, which can cause the pores to become blocked and infected. Blocked pores can then lead to the formation of spots, blackheads and whiteheads. 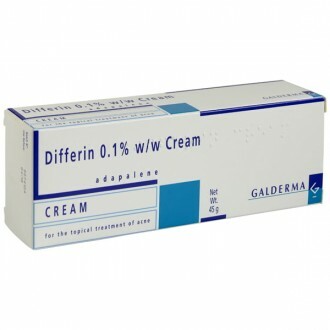 Adapalene is a topical retinoid. It is particularly effective at treating acne which has been caused by comedones (clogged hair follicles in your skin). 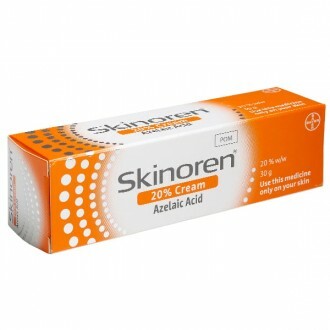 Adapalene addresses your acne by inhibiting the keratinocyte differentiation that leads to comedone formation. 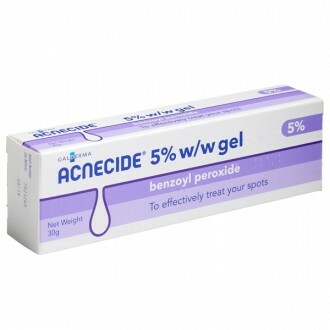 Benzoyl peroxide is a bactericide used to treat acne. It tackles acne by working as an antiseptic. This reduces the amount of acne-causing bacteria (P. acnes) on the surface of your skin. The combination of adapalene 0.1% and benzoyl peroxide 2.5% in Epiduo gel helps significantly reduce acne breakouts, as well as preventing or reducing future acne occurrences. How does Epiduo gel work? Epiduo gel contains adapalene, which is a synthetic retinoid. It works to reduce the growth of keratin surface skin cells that can block pores. When adapalene is applied to an affected area, it will help unblock the pores and sebaceous glands, allowing the sebum to escape. 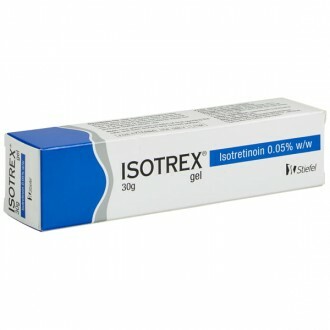 This will decrease the redness, swelling and inflammation associated with acne. Epiduo gel also contains benzoyl peroxide, an antimicrobial medicine designed to kill the bacteria that can lead to acne symptoms. It also helps promote skin turnover, which will further help clear blocked pores and reduce the bacterial count on the skin’s surface. It is effective at treating blackheads, whiteheads, and inflamed red spots. Combining both these ingredients in a single treatment will help provide an effective means of treating and controlling mild to moderate symptoms of acne. Epiduo has been clinically tested and approved for both short and long-term acne treatment. Epiduo is a good treatment option for acne that should be prescribed when benzoyl peroxide (Panoxyl) or adapalene (Differin) used on their own have failed. Using them in combination, as you find with Epiduo gel, may be more effective and help treat more severe cases of acne. 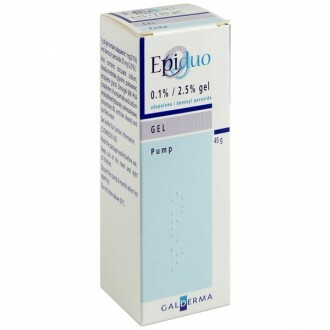 Epiduo gel is dispensed from a 45g pump. Before you apply Epiduo gel, make sure you have washed your hands and cleaned the affected area of skin you are treating. Once you have done this, use the pump to dispense Epiduo gel and apply a thin layer of the medication to your skin. This process should be repeated as directed by your doctor or pharmacist (usually once a day). Early signs of improvement in acne symptoms usually appear after 1 to 4 weeks of treatment. Reviews from users of Epiduo gel have noted the high success rate of the treatment but explained that you will need to persist (some reviewers explaining that it took 4 months to see a transformative effect) with the treatment to see positive results. These reviews detail that some users experience an initial purge period, during which you may find that your acne symptoms get worse before settling down. You may see some redness and irritation in the first few weeks of treatment. Topical antibiotics – this kills the bacteria on your skin which is responsible for infecting your clogged hair follicles. 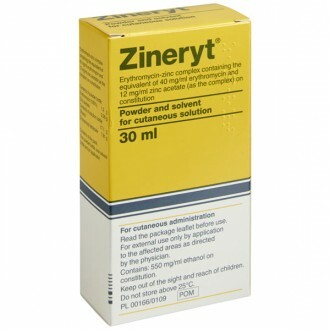 These include Zineryt and Dalacin T.
Other topical treatments - these work in a similar way to Epiduo by reducing the build-up of dead skin cells, helping to keep your pores clear and therefore stopping blackheads and whiteheads. These include Acnecide and Differin. 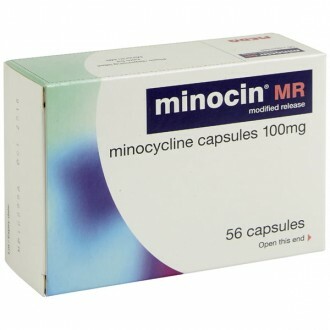 They are suitable for mild to moderate acne and can be combined with antibiotics for a greater effect. 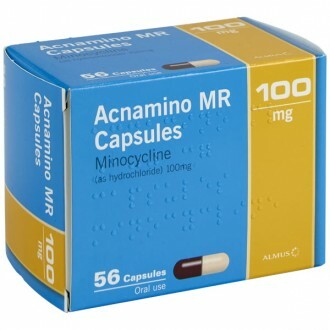 Antibiotic tablets – normally used in combination with topical non-antibiotic treatments, this also kills P.acnes and reduces the inflammation caused by acne. 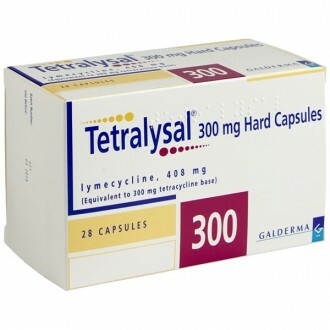 These are suitable for moderate to severe acne and include Tetralysal and Oxytetracycline. Oral antibiotics work well with Epiduo to reduce severe acne. Are there any natural treatments for acne? You can read more about preventing acne on our advice page. Apply a thin layer of Epiduo gel to the affected area once daily in the evening. You should apply gel to the whole affected area, not just the spots themselves. Use continuously for up to THREE months. You should wash your face using warm water and a mild cleanser or soap before use. Pat it dry, rubbing can irritate the skin and cause redness. If dry skin or irritation occurs at the start of treatment, try applying Epiduo every other day and slowly work up to daily applications. Epiduo gel can cause side effects in a small number of people who use it. Side effects are most common at the start of treatment as your skin gets used to Epiduo. Dry skin: If this occurs you can used a non-comedogenic moisturiser (like Cetaphil) to remoisturise the skin. Skin irritation and burning: You should reduce the frquency of application or disontinue use until your skin is better then slowly reintorduce treatment. Epiduo 0.1%/2.5% gel contains the active ingredients adapalene 0.1% w/w and benzoyl peroxide 2.5% w/w. It also contains: docusate sodium, disodium edetate, glycerin, poloxamer, propylene glycerol (E1520), simulgel 600 PHA (copolymer of acrylamide and sodium acryloyldimethylaurate, isohexadecane, polsorbate 80, sorbitan oleate) & purified water. Epiduo Gel should not be applied to skin that is broken or has eczema. Epiduo should not come into contact with the eyes, mouth, nostrils or mucous membranes. If product enters the eye, wash immediately with warm water. This product contains propylene glycol (E1520) that may cause skin irritation. If a reaction suggesting sensitivity to any component of Epiduo occurs, use should be discontinued. Excessive exposure to sunlight or UV light (including sun beds) should be avoided. Epiduo should not come into contact with any coloured material including hair and dyed fabrics as this may result in bleaching and discoloration. Epiduo should not be used during pregnancy. Need to know more about Acne? What does Epiduo gel contain? Epiduo gel is a dual-action acne treatment that contains adapalene 0.1% and benzoyl peroxide 2.5%. When combined in Epiduo gel, these two ingredients help to kill the bacteria that cause acne as well as helping to increase the turnover of keratin skin cells that can build up and block pores. How do I use Epiduo gel? In adults and children 18 years and over, Epiduo is applied once daily, usually in the evening. You should not apply Epiduo more than once in a 24-hour period. For best effects, Epiduo gel should be applied after washing your face with warm water and a mild cleanser to clear away and excess oil, skin cells and bacteria. Can I use other acne treatments with Epiduo gel? You can combine Epiduo with antibiotic acne treatments such as Tetralysal (lymecycline), Oxytetracycline, Minocin (minocycline) or Erythromycin tablets. Epiduo should not be used with any other acne creams as it may cause excess drying or irritation to your skin. I have started using Epiduo gel and the treated area is red and irritated, is this normal? Redness and irritation of the treated area can occur when you use Epiduo for the first time. This is not usually serious and normally subsides within a week. During this time reduce the frequency of Epiduo application to once every other day to allow your skin to recover and then slowly build up to applying it daily. Why can I only buy three packs of Epiduo online at one time? Epiduo Gel is an prescription-only acne treatment. For that reason, to ensure the safety of our patients and the legal & ethical operating of our pharmacy, we only supply a maximum of 3 months treatment at one time. Epiduo treatment is normally judged for effectiveness after 2-3 months. This means that if you do not find Epiduo as effective as you would like after this time, you are not stuck with an excess of medication. If you are happy with the results you can easily log in and re-order another supply. Is Epiduo available for next day delivery? Yes, we understand that sometimes you want to get your acne treatment as soon as possible. If ordered before 4pm Monday to Friday, Epiduo Gel is available for next day delivery. Is it safe to buy Epiduo gel online? Yes, as long as you are buying from a website that is a legally operating and regulated pharmacy it is perfectly safe to buy Epiduo online. The Independent Pharmacy is an NHS-registered Online Pharmacy based in Bristol and has all the necessary regulation to be able to safely provide convenient access to genuine acne prescription treatments through our Online Pharmacy & Online Doctor. How do I buy Epiduo online? Just select 'Start Consultation' above, you will need to fill in a simple health questionnaire so our GPs & Pharmacists can ensure it is safe for us to supply your Epiduo to you. It all takes around 3 minutes and your treatment can be delivered to your door. What are the advantages of buying Epiduo gel online? 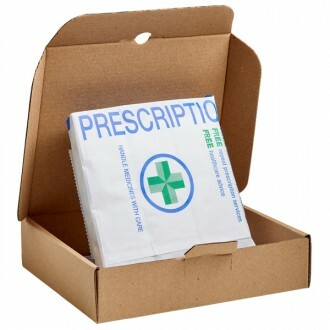 It's quick & easy - there is no need to spend time at the doctor or pharmacy. Fast delivery - We offer same day dispatch before 4pm and fast delivery to your address of choice with Royal Mail. 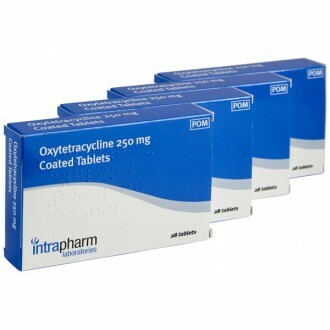 Great prices - we are able to offer very competitive prices and we guarantee to beat any other Online Doctor service. Tons of information - we provide all the information you could need on Epiduo (adapalene/benzoyl peroxide) and other acne treatments, in easy to digest formats, at a time to suit you. Does Epiduo gel work for acne scars? Epiduo gel is used to prevent, reduce, and treat existing acne. 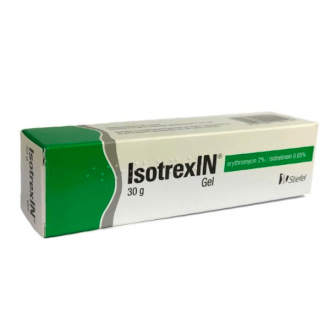 It can also help to rid your skin of acne scars that have come from previous outbreaks.